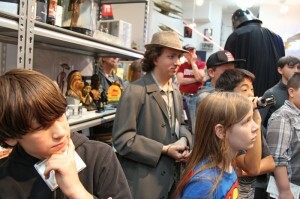 During the year, Rancho Obi-Wan frequently offers free “School Days at the Museum,” which includes about a two hour tour for a class with educational emphasis placed on a topic that the teacher requests (Star Wars and Science, The Entertainment Industry, The Impact of Popular Culture on our Lives, Creativity, etc.) Our president, Steve Sansweet, author of 16 Star Wars books, has delivered scores of lectures in the past 15 years, has been interviewed on numerous television shows and online podcasts and videos, and was a lecturer in the 1980s at the University of Southern California, where he taught courses in Basic Journalism and Business Journalism. Rancho Obi-Wan donates memberships to other registered charities for their fundraising raffles, auctions, and events. These organizations support education and schools, play centers, cancer research, and other community services. In a typical year, Rancho Obi-Wan helps raise $5,000-$7,000 for charity. For every $10.00 donated to Rancho Obi-Wan through the Donate button below we will donate a Star Wars book to Operation Paperback! Operation Paperback is a non-profit organization incorporated in the State of Pennsylvania that collects gently used books nationwide and sends them to American troops overseas, as well as veterans and military families in the U.S.
Money raised for, or donated to Rancho Obi-Wan is used for maintenance, utilities, insurance, security, professional services, public outreach and related activities; none is used for acquisitions. To help us in these efforts, simply donate any amount using the button above, become a Member, or donate a portion of your eBay sales. In-Kind donations of collectibles to display, give away or auction are also accepted. Email info@ranchoobiwan.org for more information. Like us on Facebook and share some of our posts with your friends. Join our email list and encourage your friends to do so.